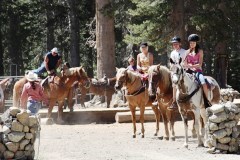 Area pack outfitters offer varied riding experiences. From short hour-long trips to week-long deluxe pack trips into the back country - the choice is yours! You won't soon forget the majestic beauty and the peaceful tranquility of the magnificent Sierras from the back of "Old Joe." You may even want to sign on for the adventure of a lifetime and join a horse drive in spring or fall!